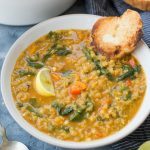 A comforting bowl of Spinach Lentil Soup made with Spinach, Red Lentil, Carrot and warm Spice is full of amazing flavours. This red lentil soup is rich in protein, fibres and is gluten-free. The ultimate one-pot Lentil Soup you would be needing this winter is right here. 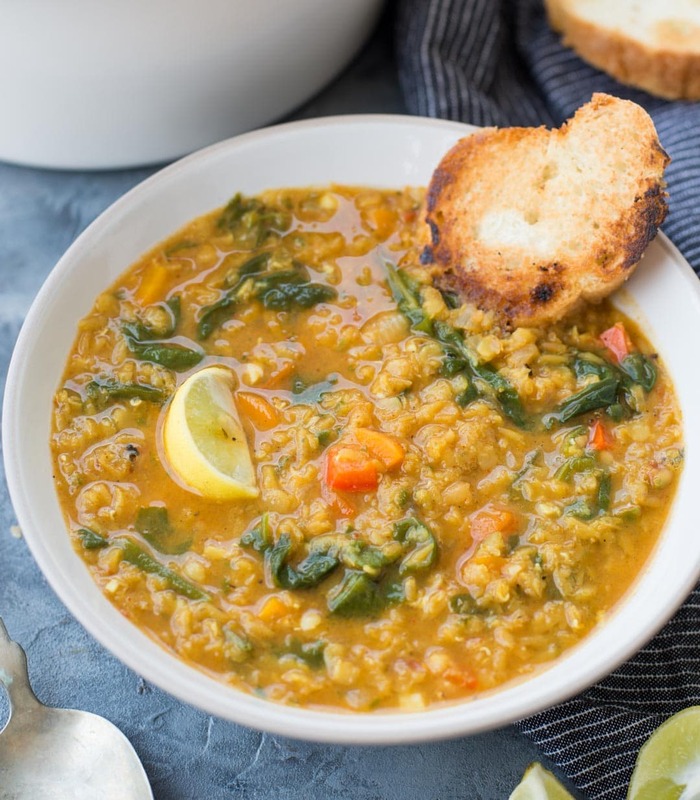 This Spinach Lentil soup is mildly spiced, flavourful with melting red lentils and spinach. It is rich in protein and fibre. This filling and super satisfying soup takes only 30 minutes to make. We are approaching towards the soup season. It is time to bring in all those warm cosy soups and stews on the table. You can never have enough soup recipes, right? I mean who doesn’t love a pot of soup simmering away in a pot and gets ready just in time for the dinner. Lentil or as we call it ‘Dal’ is an integral part of Indian Cuisine. Usually, we serve dal alongside rice or Indian bread. 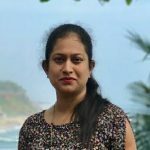 Saying that usage of dal is not limited to make stew. There are various recipes using lentils. I might end up writing a whole new post on that. But for now, let’s talk about this amazing Spinach Lentil Soup. 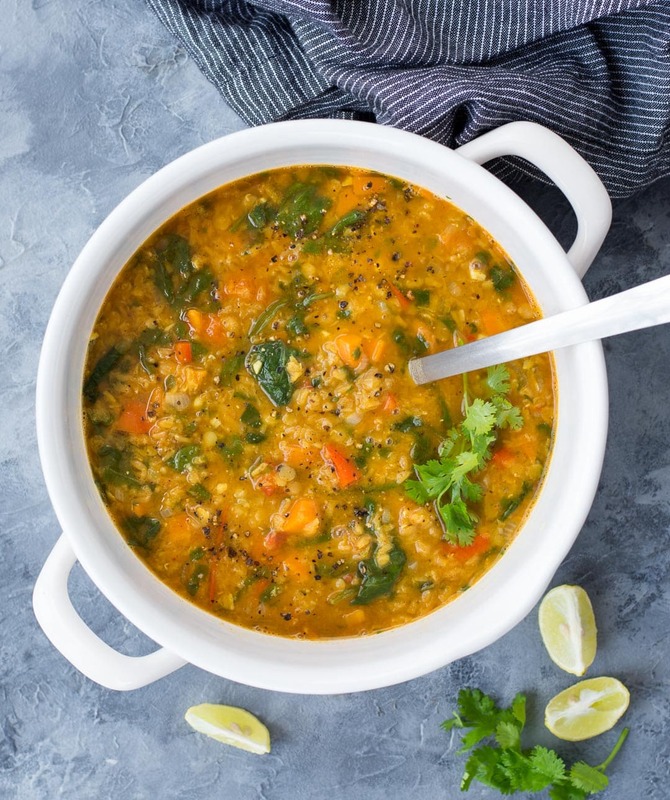 HOW TO MAKE THE BEST LENTIL SOUP? Making Spinach Lentil Soup is quite easy as you don’t need any special ingredients. Red lentil, fresh or frozen Spinach, carrot and handful of spice is all you need. I prefer using red lentil for soup because it cooks fast. You don’t have to cook on low for long hours, neither do you need to soak it. The orange looking lentil turns golden yellow once cooked. By cooking in a pot, it is easy to avoid overcooking the lentils. I like little texture in the soup, so I don’t blend it once it is cooked. For the smoother soup base, you can blend it at the end. Start by caramelizing onion and garlic in oil. Caramelizing onions and garlic add a depth of flavour. After that, it is pretty much like dumping rest of the ingredients into the pot and let it cook until vegetables are tender and Lentil is cooked. For extra flavour, I have used Vegetable stock here but water can also be used. To the end, add spinach and let it cook for a couple of minutes. Is this Red Lentil Soup Vegan? This red lentil soup is vegan and also gluten-free. It is completely a plant-based soup. This is a filling and satisfying vegetarian dinner that you can make in no time. If you want a break from indulgent eating, then this soup surely is the perfect one. Can this Red Lentil Soup be made in a Crock Pot? You can absolutely make this Red Lentil Soup in a Crockpot. If sauteing onion and garlic seems like too much of work, just dump all the ingredients into the crockpot and cook on low for 6 hours. Can you freeze the Red Lentil Soup? This Lentil Soup can be frozen easily. Once it is cold, divide into small portions and store it in food-safe Zip-lock bags. As there are no dairy products added to the soup, it can be frozen very well. Before reheating, let it thaw for 30 minutes on the kitchen counter. 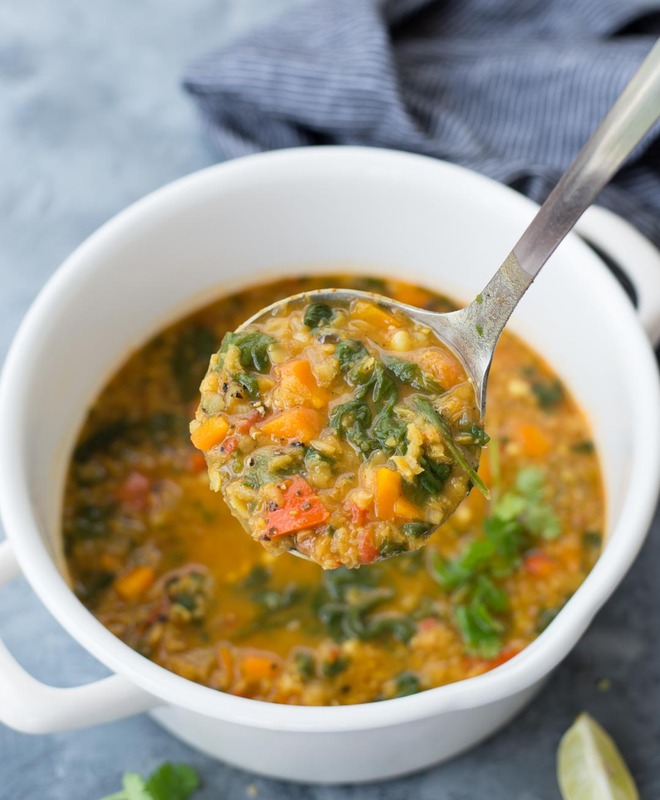 Hearty and Healthy Spinach Lentil Soup made in one pot in under 30 minutes. Vegan and Gluten-free soup. Heat oil in a heavy bottom pot. When medium hot, add chopped onion followed by garlic. Saute 2-3 minutes. The onion will start to soften and no more raw smell of garlic. Stir in chopped tomato. Saute for a minute and let tomato soften. Add chopped carrots. Saute for one minute. Stir in washed lentil, all the spices and stock/water to the pot. Season with salt. Once it comes to a rolling boil, reduce the flame and let it cook covered for another 20 minutes. When the lentil is almost cooked and carrot is tender, add Spinach to the pot. Mix well and let it simmer for 5 more minutes. Stir in fresh lemon juice. Adjust the seasoning and add more salt and pepper if required. Garnish with fresh coriander leaves when serving. Lovely comforting soup and I love spinach and with dal, it’s always divine. Made this soup for dinner this evening. What a huge hit. The only thing I adjusted was to use 2 cups water and a lower sodium broth as we are on a low sodium diet. I would recommend this soup to anyone, and have already shared with friends. This is one of favourite soup too. So happy that you liked it.